A Grain Free Diet is similar to other gluten restrictive diets. However, a Grain Free diet eliminates all foods containing grains and pseudograins, not just gluten. These further restrictions offer benefits that are not imparted by a diet that only restricts gluten. Here some of the most incredible, top benefits of a Grain Free Diet that are often reported. 1. A Grain Free Diet may benefit those with Autoimmune Conditions. Research suggests that people living with Celiac Disease often do not resolve their health concerns even when strictly adhering to a Gluten Free Diet. However, a Grain Free Diet is a significant step beyond a Gluten Free diet. 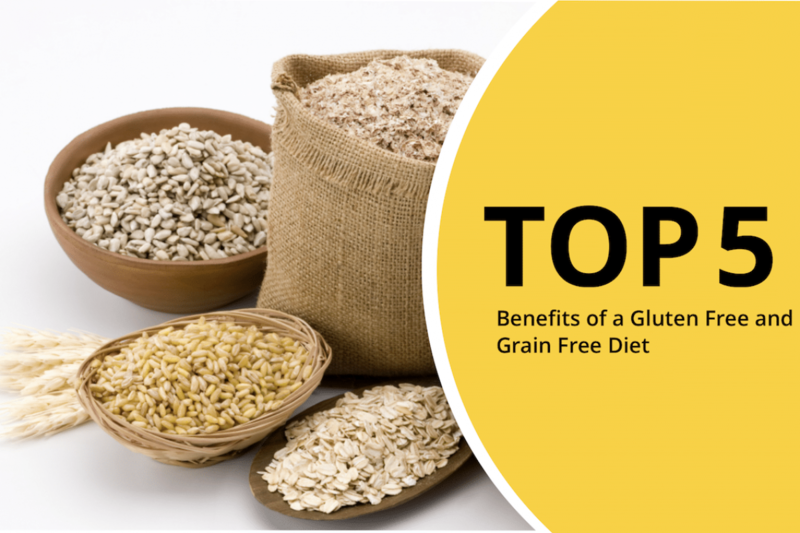 Individuals with gluten intolerance, non-Celiac Gluten Sensitivity, food sensitivities, Celiac Disease, and other autoimmune conditions often report seeing benefits of a Grain Free Diet. 2. A Grain Free Diet may benefit mental health. Recent research suggests that various mental health conditions such as epilepsy, anxiety, depression, ADD, and autism spectrum disorders may benefit from a Grain Free diet. Grains may also play a role in the development and management of schizophrenia. 3. A Grain Free Diet may also benefit the Gut Microbiome. Recent developments in gut microbiome research suggest that our microbiome has a significant effect on the development of modern diseases. However, some research indicates that the balance of the gut microbiome may benefit from the adherence to a Grain Free Diet. 4. A Grain Free Diet may aid in Weight loss efforts. A study conducted to determine whether or not a Gluten-Free diet was a suitable intervention for diseases other than Celiac Disease found that a Gluten-Free Diet reduced inflammation, insulin resistance, and adiposity. Researchers also discovered that gluten particulates translocating into other tissues influenced fat metabolism. While this research does not definitively connect weight gain to gluten in humans, a Grain Free diet may potentially aid in weight loss for individuals with increased intestinal permeability. 5. A Grain Free Diet may improve energy. Chronic fatigue is a symptom of gluten intolerance, as well as a symptom that is common in individuals with autoimmune disease. Eliminating grains from the diet may improve overall mood and energy. To be fair, nothing is inherently wrong with grains. In fact, most evidence suggests that grains are a healthy part of a human diet. While grains may be healthy for the majority of the population, this may not be universally true for all individuals. Although it is largely anecdotal, people worldwide have reported relief from a myriad of health concerns on a Grain Free Diet or a Paleo Diet. Given the etiology and prevalence of autoimmune disease worldwide, these reports make sense. Many people begin a Grain Free Diet with the hopes of achieving weight loss, improvements in mood and cognition, improved insulin sensitivity, and respite from the scourges of autoimmune disease. While there are benefits of a Grain Free Diet, a Grain Free Diet or Paleo Diet is not designed to treat or prevent illness. A Grain Free Diet or Paleo Diet is a supplemental tool to help your medical or health care provider throughout your journey to health. Proper medical supervision is necessary. See these 5 common symptoms of gluten intolerance to see if your health concerns may benefit from a Grain Free Diet. Please note that the adoption of a Grain Free or Paleo Diet may not be beneficial or even necessary for the individual and may even have unintended consequences. Unwarranted dietary interventions such as a Gluten Free or Grain Free Diet may contribute to a reduced consumption of prebiotic polysaccharides, which may reduce beneficial indigenous bacteria and increase pathogenic, enterobacterial counts. Next article Gluten Sensitivity vs Allergy: What’s the Difference?